The dread that filled the 2013-2014 National Hockey League season is finally beginning to dissipate in the Pacific Northwest, as the Vancouver Canucks introduced their new General Manager Jim Benning to the media. Friday’s question and answer period, however, was particularly telling of the sentiments the fan base holds, as season ticket holders quizzed Benning on surprisingly hard topics. 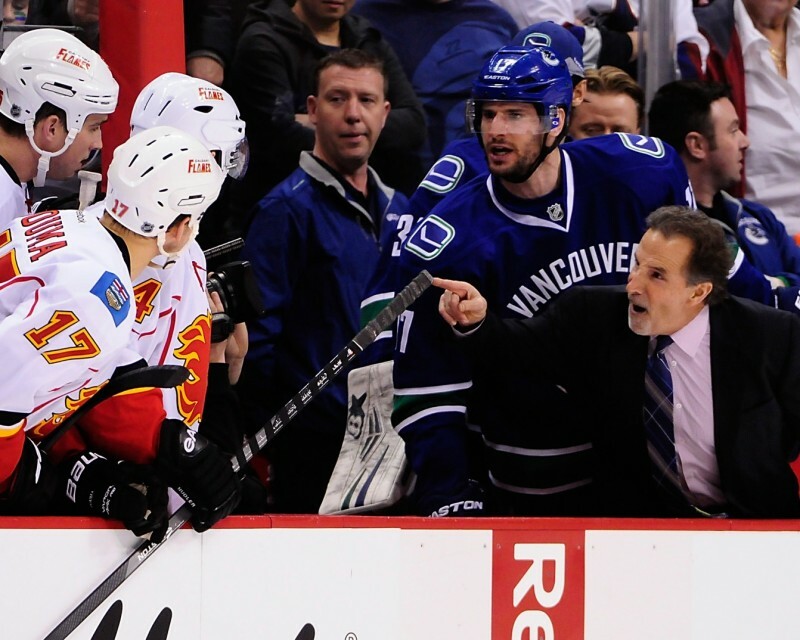 The cynicism Canucks fans displayed is understandable, as it was not too long ago that a summer press conference provided them with false optimism in the presence of John Tortorella, and the fan base seems much wiser to it. Benning is obviously leaning towards a retool, a decision that is admirable, but ultimately unwise. FIRST THING’S FIRST, WHO’S GOING TO COACH? Jim Benning has a long list of things to accomplish in order to make the Vancouver Canucks a Stanley Cup contender once more, but the first thing he needs to do is find a new head coach. Benning: "We want a coach that is form, but fair, that has good communication skills so he can relate to players." As soon as Benning’s name was attached to the Canucks, Barry Trotz became the first choice to fill Tortorella’s vacant spot. Trotz is what Benning is describing: a teacher who can mold to his players and play the style of game that fits the team the best. It’s easy to attribute a style of defensive hockey to Trotz because of his time in Nashville, but he did lead the Predators to a top 5 finish in scoring in 2006-07 and a top 8 finish in 2011-2012. These facts seem to place Trotz as the perfect hire for the Canucks. But it all is a moot point since he seems to be heading to Washington to try and finally crack the code that would make Alex Ovechkin a defensively sound, all around hockey player. The reason behind outlining Trotz’s fit as a perfect candidate despite the fact that he isn’t going to Vancouver is that this situation seems to exemplify where the team is at this point in time. They could have gotten a stellar coach who could lead them to a playoff berth, but when Benning eventually settles for his number two coach, is this team any closer to recapturing the magic from 2011? Without Trotz, that doesn’t seem likely. When talking about the core of the Vancouver Canucks, these three words are brought up with the most frequency; three words Jim Benning and Trevor Linden apparently do not own in their vocabulary. The fact of the matter is that this team is old, aging and declining, but Benning is handcuffed with two fresh new contracts for the Sedins and a litany of no movement clauses. Because of all this, Benning seems to believe blowing the core isn’t realistic. Every Canucks fan remembers the shift, and every Canucks fan knows that the magic of those two plus minutes has rarely been seen from Daniel and Henrik Sedin in recent years. Maybe it is because Tortorella’s system was too defensive, and that hampered their cycle. Maybe, and more likely, it is because they’re getting older. The twins will turn 34 before next season and are the face of an aging core, much like Jarome Iginla was a few years back. If there ever was an argument to be made against retooling, the Calgary Flames would be a prime example, and it should serve as a warning for the Canucks. Benning can’t wait until the Sedin’s or, more importantly, Ryan Kesler’s trade value is non-existent. A one-year attempt at re-tooling the Canucks may offer them a chance at partaking in playoff hockey once more, and give them enough time before trade values begin to dwindle. Benning is stuck between liking an aging core and knowing that in order for the team to get better, he will have to trade some players. It is deciding between offloading the veterans for young talent and bringing in a veteran bottom six that will pave the way for this team not just next year, but for a long time afterwards. A retool is for the immediate future, and Benning has to look long term. Would a retool this summer capture playoff hockey in two, three years from now? More importantly, are the Canucks not just playoff fodder, but Stanley Cup contenders in the coming seasons? Not without a full-blown rebuild they aren’t.